Abell 370 has several hundred galaxies in its core, or center. This galaxy cluster has a storied astronomical history and was one of the first clusters in which astronomers observed gravitational lensing. In the archival Hubble image at below right, the long arc on the right was found not to be a member of the cluster by ground-based observations. The arc is actually a lensed galaxy residing two times farther away than the cluster. The Abell catalogue of galaxy clusters was first compiled by astronomer George O. Abell in 1958, with over 2,700 galaxy clusters observable from the Northern Hemisphere. The Abell catalogue was updated in 1989 with galaxy clusters from the Southern Hemisphere. Abell 370 is the most distant galaxy cluster in the Abell catalogue, but we now know of many galaxy clusters that are even more distant. Left: The locations of Hubble’s observations of the Abell 370 galaxy cluster (right) and the adjacent parallel field (left) are plotted over a Digitized Sky Survey (DSS) image. The blue boxes outline the regions of Hubble’s visible-light observations, and the red boxes indicate areas of Hubble’s infrared-light observations. A scale bar in the lower left corner of the image indicates the size of the image on the sky. The scale bar corresponds to approximately 1/30th the apparent width of the full moon as seen from Earth. Astronomers refer to this unit of measurement as one arcminute, denoted as 1′. Right: Hubble’s view of the galaxy cluster is displayed using archival visible-light observations. 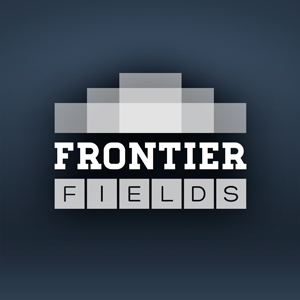 Deeper Frontier Fields observations of Abell 370 are being planned.